What are you going to wear this Thanksgiving season? A turkey crochet hat will put a smile on anyone's face and smiles are always something to be thankful for! Maybe you can make one for everyone in the family and take a goofy family picture for your annual holiday card. 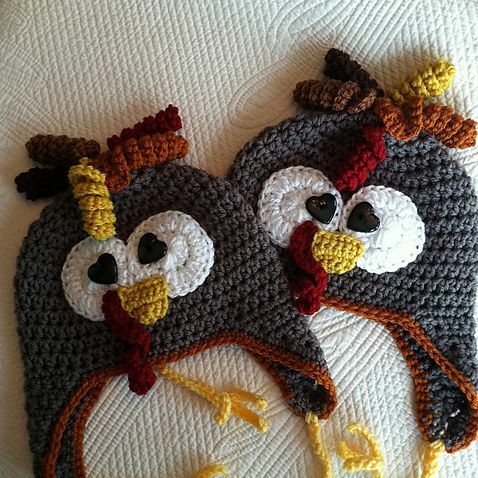 Or perhaps you just want to make a turkey hat for a little turkey in your life; babies look adorable in animal crochet hats! Whatever your age, whatever your Thanksgiving style, one of these ten free crochet turkey hat patterns should be the right one for you! Turkey Earflap Hat FREE Crochet Pattern. This turkey crochet hat from Lakeview Cottage Kids has earflaps so it will keep your head nice and cozy if the weather has turned cold where you live. It is also a super cute design and it's fun to make with the corkscrews it incorporates! Newborn Turkey Hat FREE Crochet Pattern. The Stitchin' Mommy created this free crochet hat pattern for newborns. Baby's first Thanksgiving will look as cute as can be when the pictures prominently feature this holiday crochet hat! Turkey Hat FREE Crochet Pattern. Adults can get in on the Thanksgiving fun, too. The Shtick I Do offers this free crochet turkey hat pattern for a turkey beanie. This hat is perfect if you are running in a "turkey trot" race before the Thanksgiving meal. Baby Turkey Hat Crochet Pattern. This crochet baby hat pattern has instructions for various sizes ranging from preemie newborn to toddler. The instructions are clear enough that you could easily figure out additional larger sizes if you want to make this crochet hat for older kids as well. Braided Earflap Turkey Hat FREE Crochet Pattern. Cari Kessler's child-size crochet hat pattern is a turkey earflap hat with an adorable orange pom on top and braids on the side. It's a Ravelry download free pattern. Gobble Gobble FREE Crochet Turkey Hat Pattern. This crochet hat pattern also has braids but they are worked in brighter colors. There's a top that's similar to a pom pom but worked entirely differently from other styles. This hat pattern allows you to stretch your crochet skills and learn some new techniques. This turkey hat crochet pattern from My Creative Side has braids, earflaps, and a corkscrew top. It's designed with instructions for every size from baby to adult, so you can make one for anybody! Turkey Hat FREE Crochet Tutorial. This is a free video tutorial for a crochet turkey hat pattern that can be made in all sizes from baby through adult. Make one for everyone in the family and take that memorable holiday photo! One-Year-Old's Crochet Turkey Hat FREE Pattern. If there's a twelve-month-old little one in your life then this turkey hat pattern is the perfect choice. The free pattern can be adapted to sizes about six months younger or older.